Exxon Mobil Sues After Treasury Fines It $2 Million For Alleged Sanctions Violations : The Two-Way The U.S. Treasury is accusing Exxon Mobil of violating sanctions on Russia in a series of deals in May 2014. "What were they thinking?" wonders one of the architects of the sanctions. The U.S. Treasury's Office of Foreign Asset Control says that Exxon Mobil must pay a $2 million penalty for allegedly violating sanctions on Russia. 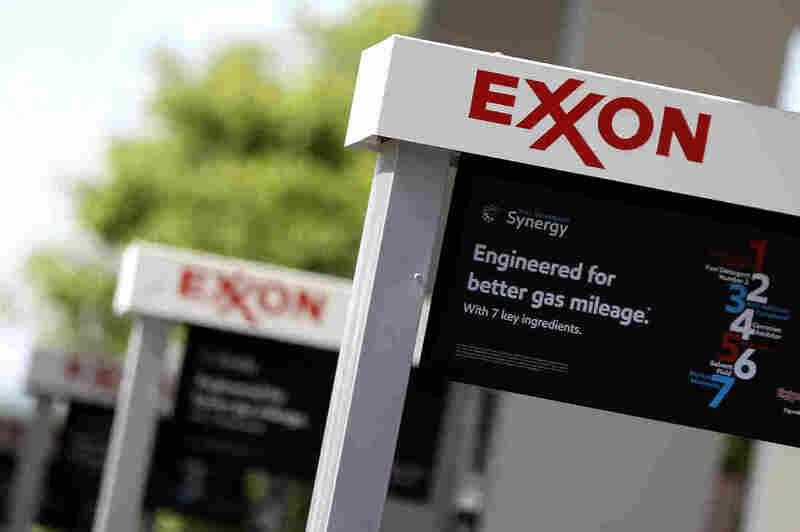 Exxon Mobil says it has filed a lawsuit against the U.S. Treasury's Office of Foreign Asset Control, after the office said the oil and gas giant must pay a $2 million penalty for allegedly violating sanctions on Russia. The alleged violations took place in May 2014, when Exxon Mobil signed a series of deals with Igor Sechin, the CEO of Russian oil company Rosneft. That March, the Obama administration had placed Sechin on a Treasury blacklist — but OFAC says that Exxon Mobil executives still did business with him. The U.S. imposed sanctions in response to Russia's seizure of Crimea in 2014. OFAC and Exxon Mobil are disagreeing over the scope of the sanctions — specifically, whether the sanctions pertain to Sechin exclusively in his personal capacity, or whether they also extend to his professional interests at Rosneft. Rosneft is not sanctioned. OFAC said in a statement that the language of the sanctions is clear and does not include a " 'personal' versus 'professional' distinction." It said that "ExxonMobil demonstrated reckless disregard for U.S. sanctions" and added that the company's top executives were aware of Sechin's sanctioned status when they did business with him. Additionally, it said that guidance on the OFAC website pertaining to a separate sanctions regime against Myanmar specifically said that individuals and companies should avoid entering into contracts with people on the blacklist. However, Exxon Mobil is accusing OFAC of trying to retroactively enforce a new interpretation of the sanctions. It said that at the time, the "White House and Treasury Department officials repeatedly said sanctions involving Sechin applied only to his personal affairs and not to companies that he managed or represented." Exxon Mobil's lawsuit also names U.S. Treasury Secretary Steven Mnuchin and OFAC Director John E. Smith. "You've got to wonder why Exxon Mobil simply didn't sign the contract with someone other than Sechin" at the Rosneft company, Atlantic Council fellow Daniel Fried, a former State Department official and one of the architects of the sanctions, told The Two-Way. "What were they thinking?" Fried stressed that while he wasn't in a position to give a legal opinion, "my view is that OFAC's probably right." He added: "In my experience, OFAC is careful before they take this step. They don't lose a lot of cases." When the deals in question were signed, Secretary of State Rex Tillerson was CEO of Exxon Mobil. NPR's Michele Kelemen reports that Tillerson's "spokesman had no comment about the Treasury Department's action." According to The Associated Press, Tillerson is quoted as saying in May 2014 that "the company generally opposes sanctions and finds them 'ineffective.' "
Michele points out that the $2 million fine "amounts to about 10 percent of one day's earnings from Exxon Mobil." NPR's Jackie Northam reported in 2014 that the inclusion of Sechin's name on the Treasury blacklist created significant uncertainty for U.S. oil and gas companies. "Igor Sechin was often the man that interacted with Western oil executives," Jackie reported. She added that "Exxon Mobil has deep connections with Rosneft and has signed several major contracts over the past few years, including this one for oil and gas exploration in the Arctic."